Prefer to keep all distribution-related work – including printing – under one roof? Let’s see if Aero can spare you some printing hassles. For many kits we print some, most, or all pieces in-house. Our full-color digital printer produces high-quality results in sizes and quantities from small to large. Need letter-quality personalization? Or will a generic message do? We’ll produce either – from one to a million pieces – with our high-quality laser printers. Aero also offers shrink-wrapping and polybagging services. On the data processing side, we do data entry, file management, list maintenance, and merging/purging of files. We also handle address standardization, postal qualifications, ZIP + 4 coding, bar coding, carrier routing, and production of personalized envelopes. 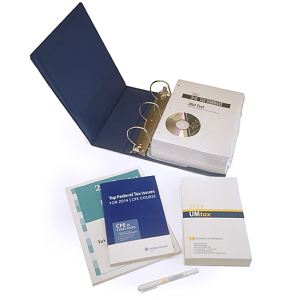 In the last quarter of each year, Aero helps the University of Michigan Conference Series by assembling, wrapping, and sending tax-related study materials to seminar attendees.